For years, Germany has dominated European economics, acting as the robust engine-room of the eurozone. While struggling nations have looked to Germany for leadership and stability, the country itself has maintained a steady level of growth under the guidance of Chancellor Angela Merkel. Recently, however, there have been alarming signs of a slowdown in the country’s economy. In December last year, the Bundesbank – Germany’s central bank – slashed its growth forecasts and warned of a potential recession. Revising the forecasted growth rate of 1.6 percent down to almost 0.4 percent, the central bank delivered the ominous news just under a year before Germans go to the polls to elect a new government. If the new forecasts are accurate, then Merkel’s re-election chances will become significantly less likely. The downturn is the result of myriad factors. While the current mess that is the eurozone has obviously impacted upon Germany, there have been underlying issues within the domestic economy that are now beginning to simmer over. In its monthly report for December 2012, the Bundesbank said: “The cyclical outlook for the German economy has dimmed.” The reasons for this were said to be a weakening industrial sector. The central bank added: “Following a 0.7 percent expansion in real GDP in the current year, or 0.9 percent after adjustment for calendar shifts, economic growth could decline to 0.4 percent on an annual average in 2013, before strengthening to 1.9 percent in 2014. The German administration also attempted to remain positive about the news, with government spokesman Steffen Seibert telling reporters: “It is no secret that we’re in a phase of economic cooling. But we have no doubt that the economy is still in growth mode. There are a whole range of indicators which in no way point to recession. The government remains cautiously optimistic.” Analysts, however, said the figures released by the Bundesbank were a reflection of the decline in orders of German products from overseas. Commerzbank’s Chief Economist, Joerg Kraemer, told Reuters the 0.2 percent growth in the economy between July and September in 2012 was probably “the last good number from Germany for the time being”. He added: “The German economy will probably shrink somewhat in the fourth quarter given that orders have been falling for the last year and the business climate, as measured by the Ifo Institute of Economic Research, has recently caved in.” The wider issue of the eurozone remaining intact has occupied much of German administrations’ time over the last couple of years, and with good reason. Maintaining the single currency allows Germany to benefit from comparatively low exchange rates, which help its strong export market on the world stage. Indeed, the low value of the euro has helped Germany boost its trade with the likes of the US and Japan. Figures released at the end of 2012 showed that, although there had been a weakening of Germany’s exports during the year, 2013 could see the country rely on Asian demand. According to the Federation of German Wholesale, Foreign Trade and Services, the country will see its exports rise by almost five percent in 2013 to around €1.16trn. Last year’s figure of nearly €1.103trn exports was also a record and helped the country stave off a possible recession. However, a shrink in manufacturing activity for the tenth consecutive month last December – a result of a fall in production and fewer orders – saw Markit’s Purchasing Managers’ Index drop to 46.0 from 46.8 the previous month. With Germans set to go to the polls in late 2013, the state of the economy in the run up to the vote will likely play the most crucial role in who emerges victorious. Although opinion polls at the turn of the year left Merkel’s coalition government without a majority, she should be able to negotiate a third term in office with other parties propping up her centre-right Christian Democratic Union (CDU). 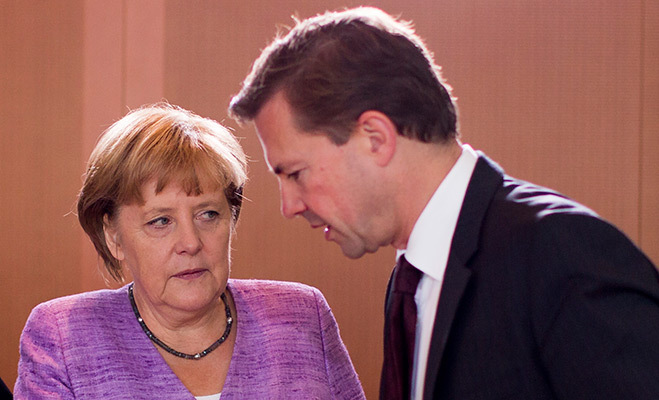 The CDU’s current partner, the pro-market Free Democratic Party, is in a state of turmoil, and Merkel may have to seek agreement with the Social Democrats or the Green Party. The Bundesbank explained that its projections were mostly the result of global uncertainty, and predicting where the German economy will be over the course of the next 12 months will be particularly difficult. Regardless of what happens in the eurozone, the bank stressed Germany’s underlying economic strength should see it through any serious difficulties: “The current projection is characterised by a high degree of uncertainty.